Backlinks and SEO (search engine optimization) success are always linked together. It is understood that a website with plenty of quality backlinks usually ranks high in Google’s search engine results pages (SERPs). That’s why many SEO firms, website owners, and Internet marketing professionals incorporate link building strategies into their SEO plan – in hopes of enhancing their search performance on the Web. What is a backlink? A backlink – sometimes called incoming link, inbound link, or inward link – is a link that points to a website or web page, coming from another site or page. A quality backlink is often considered a vote of confidence, as it signifies that the backlink source trusts a website or page well enough to lead or direct the source’s visitors to the backlinked site. SEO experts, website owners, and online marketers know that it’s not enough to get as many backlinks as possible. Quality matters, too, and perhaps – in these days of Google updates – more than quantity. Indeed, to truly improve a site’s ranking in the SERPs, quality backlinks must be obrained. PageRank of the linking site. PageRank is the link analysis algorithm used by Google to determine and measure the authority of a given website. Make sure that when you’re looking to generate new backlinks, they’re coming from a site with high PageRank (at least 4 or above). Relevance of the linking site. 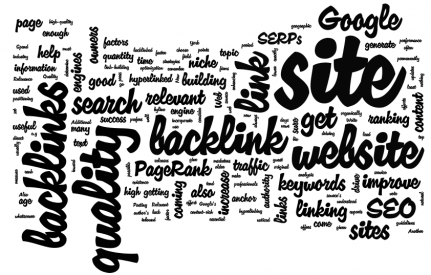 A good quality backlink should also come from a site that is relevant or is in the same niche as your website. This is because sites that are on the same niche and tackle a specific topic will have more authority for you than sites that have nothing to do whatsoever with your own field of interests or industry. Also, getting links from sites that are in the same category that you’re in will increase the potential of getting not just quality backlinks, but also site traffic. The age of the linking site. The age of the website is also one factor that can improve the quality of the backlink. Google looks at how old the site has been in existence. The older and more content-rich the site is, the more credit Google will give to the backlink. Natural backlinks. You should build links organically and honestly, as Google prefers links coming from natural sources. Black-hat link-building techniques can improve the sites’ ranking but only for a temporary period of time, as this is against the guidelines set by the different search engines. If search engines discover what you’re doing, and what you’re doing is exactly what they’re discouraging, be prepared to have your site rank lower or banned temporarily or permanently from SERPs. Relevant keywords used for the anchor text. When hyperlinking your anchor text, make sure you choose relevant keywords that are related to the niche, topic, or product or service. (You can even add geographic information to your hyperlinked keywords, e.g. “Carwash Shop New York” ). This can help the site get indexed faster and can increase the positioning in SERP.So how can a site then get quality backlinks? Spend time and effort in producing a site that has relevant content. Visitors will tend to go back to your site if it offers meaningful and useful information for them. Posting original Web content can drive traffic to your site and will help to get noticed by search engines like Google. Once you have established a quality site, backlinks will come naturally as other website owners would want to improve their ranking too by linking to your good site. Another way to get good backlinks is by writing content for high-quality sites. This can be in the form of a guest blogging or blog commenting, both of which can be used to insert relevant hyperlinked keywords in the byline or author’s bio. Write press releases for news and media websites that customers and stakeholders will find valuable and useful. Include a backlink to your site to increase your PageRank and drive traffic to your website. When it comes to link building, quality certainly counts more than quantity. So when you start your link building campaign, remember to consider the factors mentioned above, so you can generate quality backlinks essential in driving the success of your SEO efforts. About the author: Abie has been a blogger for more than five years now. She’s interested in writing technology and SEO-related articles. She currently works as an article writer for Pak30.fr, a site where you can get Eastpak in France.